BET and Kelly Rowland are holding nationwide auditions for singers and dancers who think they have what it takes to be stars for the Kelly Rowland Project. 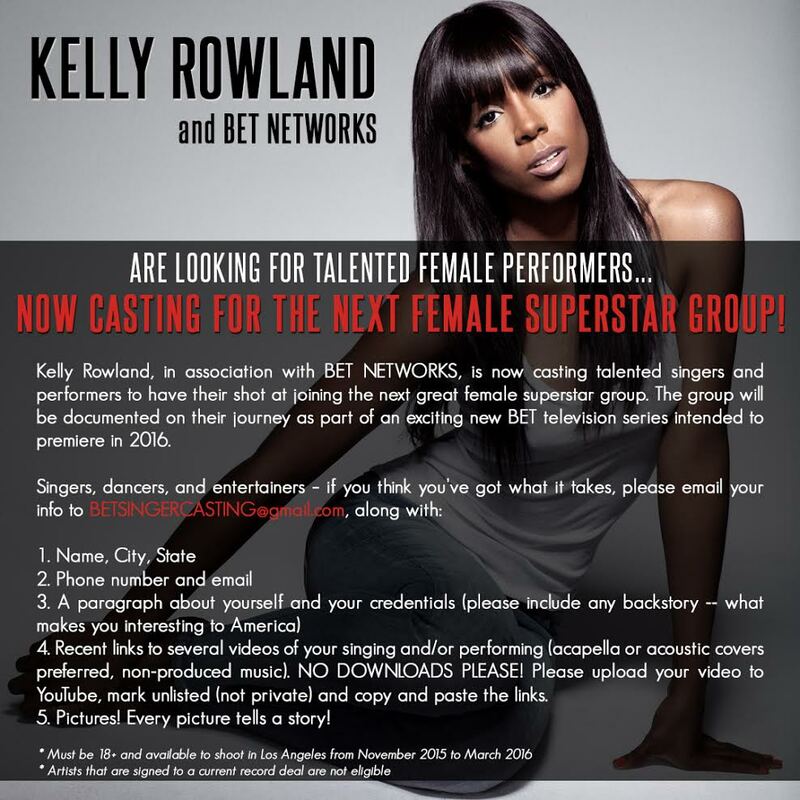 KELLY ROWLAND WITH BET NETWORKS IS LOOKING FOR TALENTED FEMALE PERFORMERS! NOW CASTING FOR THE NEXT FEMALE SUPERSTAR GROUP. Kelly Rowland, in association with BET NETWORKS, is now casting talented singers and performers to have their shot at joining the next great female superstar group. 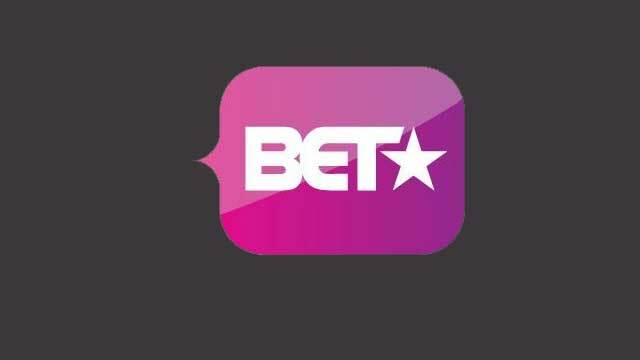 The group will be documented on its journey as part of the exciting new BET television series intended to premiere in 2016. 3. A paragraph about yourself and your credentials (please include any backstory– what makes you interesting to America). 5. Pictures! Every picture tells a story! I tried to submit my information but I got a reply email saying that the email is over quota. Does that mean I’m too late? OMG miss Kelly Rowland if you are reading this I would be more than happy to be apart of your project. It’s been my life dream to be on stage since I was 7 years old and I don’t know if I have a chance or not, but I’m willing to give all I got. Hey Kelly, I’m ten years old and ever sine I was 4 years old, I have been singing. I know I don’t fit the age groups but I just want my voice to be heard, not just for the money. Maybe you can change the age groups. Hey Kelly, my name is Tiara. I know your looking for girl’s that are 18+ but, I’m 14 going on 15, this has been a dream for me to become a star. Trust me it’s not about the money or the fame. It just that god gave me a gift and I want to use it. I know your saying I’m to young. I must say, Miss Kelly that doesn’t take away what I have, I’m one of those girls your looking for. If I can’t be in the group I would love to be a solo artist. I just ask for a chance. I know you understand how it feels to want something so bad but all you need is a push. This is my push. I know it’s a big amount of work to be down. I’m willing to do this. Kelly, I don’t fit the age of group of girls, but I am and up and coming R&B singer from Memphis Tennessee, but live in Los Angeles. and I am coming out with my first song that I wrote and produced. The name of my song is “I Wanna Be Famous Be A Superstar”. This song can be a theme song for your show, here is video that you can here and see me sing the song. It is nice, but I am a great singer. If you are looking for an, Artist I am that. Click on the link below and see the video, Tell BeYounce , I would love to be on her Record label. Also if you need help with the girls I can help. I know you don’t need my help, but I am just asking. Thank You https://www.facebook.com/lfrayser/videos/892610650824194/?l=5853515560850273786.